“Smile lines” or “laugh lines” are common terms used to describe the lines or skin folds that start forming at both sides of the nose and run to the corners of the mouth. It is typical for these folds to become more pronounced as the aging process continues. The wrinkles and folds that become evident with the aging process are due to a loss of collagen and elasticity in the skin, as well other factors such as how much sun exposure a person has had, genetic predispositions, and if a person is/was a smoker. Despite how common wrinkles and skin folds in the face are, they tend be to be undesirable because they can make a person appear older or more stressed/tired than they actually are. Because of the generally unfavorable feelings towards the appearance of wrinkles and skin folds, new treatments and procedures designed to get rid of these effects of aging are always being created. Ever since its approval by the FDA in 2002, Botox has become one of the top non-surgical aesthetic procedures performed in this country. Its use for the treatment of wrinkles and skin folds might be its most popular. The myth that Botox creates a “frozen face” needs to be dispelled; when performed skillfully and correctly, Botox will get rid of the look of age and tiredness caused by loose or wrinkled skin, while still allowing you to preserve your natural facial expressions. 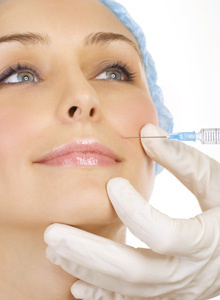 Botox works great to ease the nasolabial lines that become more prominent with age. There is no down time associated the Botox procedure, the patient feels little to no discomfort before and after treatment, and it only takes a couple of days for a patient to start to see results. Facial expressions, such as smile lines, are created when nerves in the body send signals to the brain, telling the specific muscles in an area to move. The Botox injectable works once it has been placed under the skin by blocking the release of neurotransmitters, which are responsible for sending these messages, thus inhibiting the muscle to contract. In the case of diminishing smile lines, once Botox is injected the muscles in this area retract back into its relaxed state, providing a less indented, smoother-looking area between the nose and mouth. Dr. Pappolla of Botox Houston is an MD who is fully educated in Neurology and Anatomic Pathology, as well as in all the protocols and techniques involved in performing Botox injections, leaving him more than qualified to inject patients. Botox Houston has a record of patients who have become satisfied and happy with the results of their treatments. Smoother and younger-looking skin is a possibility with the Botox cosmetic.